In my earlier post, I had described a simplified view of how Word2Vec method uses neural learning to obtain vector representations for words given a large corpora. In this post I will describe another approach for generating high-dimensional representations of words via looking at co-occurrences of words. This method is claimed to be much faster as it avoids time consuming neural learning and yields comparable results. The above table shows that “a” is followed twice by “penny” while words “earned”, “saved”, and “wise” each follows “penny” once in our corpus. Thus, “earned” is one out of three times probable to appear after “penny.” The count shown above is called bigram frequency; it looks into only the next word from a current word. Given a corpus of N words, we need a table of size NxN to represent bigram frequencies of all possible word-pairs. Such a table is highly sparse as most frequencies are equal to zero. In practice, the co-occurrence counts are converted to probabilities. This results in row entries for each row adding up to one in the co-occurrence matrix. The concept of looking into words co-occurrences can be extended in many ways. For example, we may count how many times a sequence of three words occurs together to generate trigram frequencies. We may even count how many times a pair of words occurs together in sentences irrespective of their positions in sentences. Such occurrences are called skip-bigram frequencies. Because of such variations in how co-occurrences are specified, these methods in general are known as n-gram methods. The term context window is often used to specify the co-occurrence relationship. For bigrams, the context window is asymmetrical one word long to the right of the current word in co-occurrence counting. For trigrams, it is asymmetrical and two words long. In words to vector conversion approach via co-occurrence, it turns out that a symmetrical context window looking at one preceding word and one following word for computing bigram frequencies gives better word vectors. Hellinger distance is a metric satisfying triangle inequality. The reason for including in the definition of Hellinger distance is to ensure that the distance value is always between 0 and 1. When comparing a pair of discrete probability distributions the Hellinger distance is preferred because P and Q are vectors of unit length as per Hellinger scale. The approach in a nutshell is to create an initial vector representation for each word using the co-occurrences of a subset of words from the corpus. This subset of words is called context words. The initial vectors produced in this manner have dimensionality of few thousands with an underlying assumption that the meaning of each word can be captured through its co-occurrence pattern with context words. Next, a dimensionality reduction via principal component analysis (PCA) is carried out to generate final word vectors of low dimensionality, typically 50 or 100 dimensions. The diagram below outlines the different stages of the word vector generation process. A typical choice for context words is to choose top 5 to 10% most frequent words resulting in words. The next step is to calculate matrix of co-occurrence probabilities. Typically, a symmetrical window of size three centered at the current word is used to count co-occurrences of context words appearing within the window. The SQRT(2) operation consists of simply dividing every co-occurrence matrix entry by to ensure the range of Hellinger distance between 0-1. The final step is to apply principal component analysis (PCA) to minimize the reconstruction error measured in terms of Hellinger distance between the original and reconstructed vectors. Since the co-occurrence matrix is not a square matrix, PCA is applied via singular value decomposition (SVD) to extract top 50 or 100 eigenvalues and eigenvectors and transform the raw vectors of the co-occurrence matrix to generate final word vectors. See an example in the comments section. 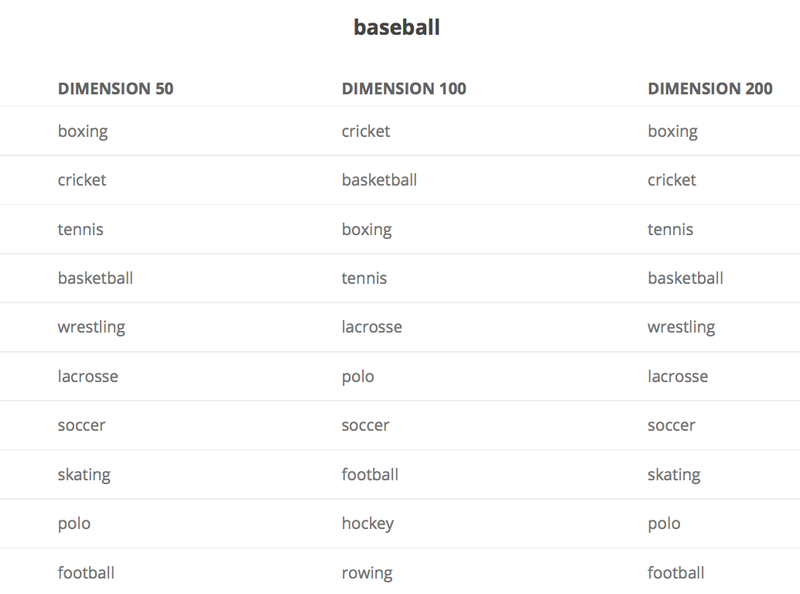 How good are Word Embeddings? 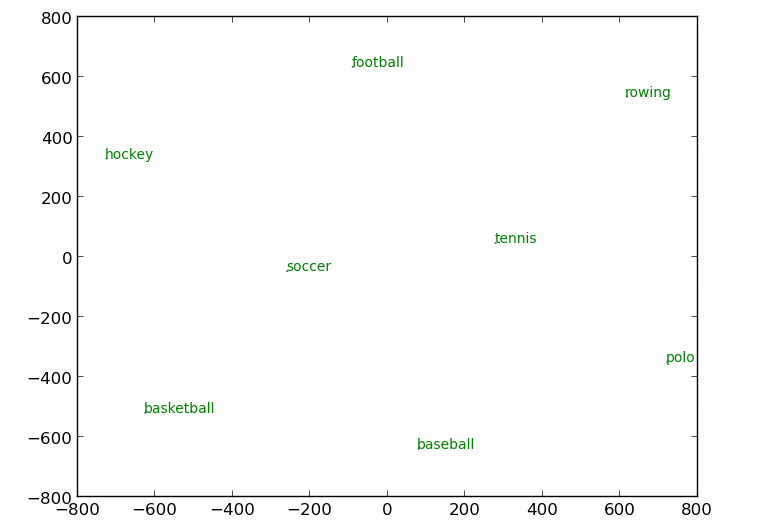 For example, I got the following list of nearest neighbors for “baseball.” Pretty neat! The approach briefly described above is not the only approach for word embeddings via co-occurrence statistics. There are few other methods as well as a website where you can compare the performance of different word embedding methods as well as make a two-dimensional mapping of a set of words based on their similarity. One such plot is shown below. The work on word embeddings by several researchers has shown that word embeddings well capture word semantics giving rise to searches where concepts can be modified via adding or subtracting word vectors to obtain more meaningful results. 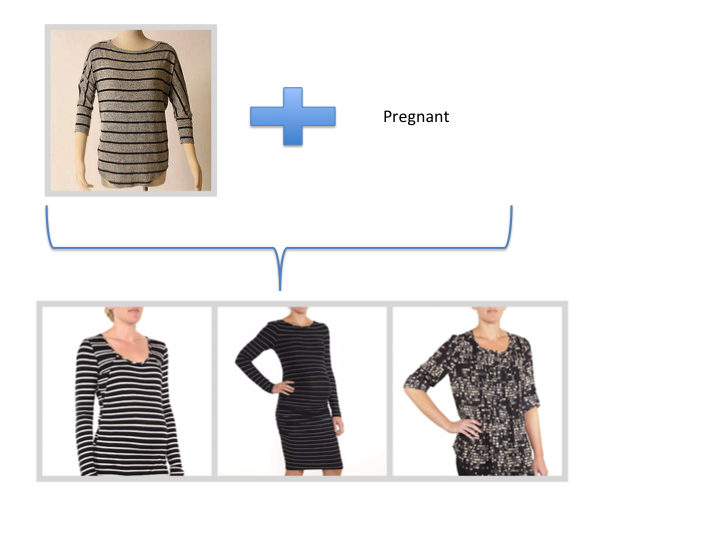 One interesting application along these lines is being developed by Stitch Fix Technology for online shopping wherein the vector representations of merchandise is modified by word vectors of keywords to generate recommendations for customers as illustrated by the following example. We can expect many more applications of word embeddings in near future as researchers try to integrate word vectors with similar representations for images, videos, and other digital artifacts.